Recipients of the Oracle PartnerNetwork Awards - Pakistan FY09 at OPN Day – Pakistan with (2nd row First from Left) Sean Baptist, General Manager, Alliances & Channels, ASEAN; (2nd row third from left) Farhan Ibrahim, Country Director, Technology Business, Oracle Pakistan and Afghanistan, (2nd row fourth from right) K Raman G Kesawannair, Regional Managing Director, ASEAN and SAGE and (2nd row fifth from right) Syed Rizwan Munawar, Country Manager - Applications Business, SAGE West. The FY09 OPN Awards recognized seven leading partners, across ten categories for their excellence in Technology, Applications, Industry, Oracle Accelerate and mid market. 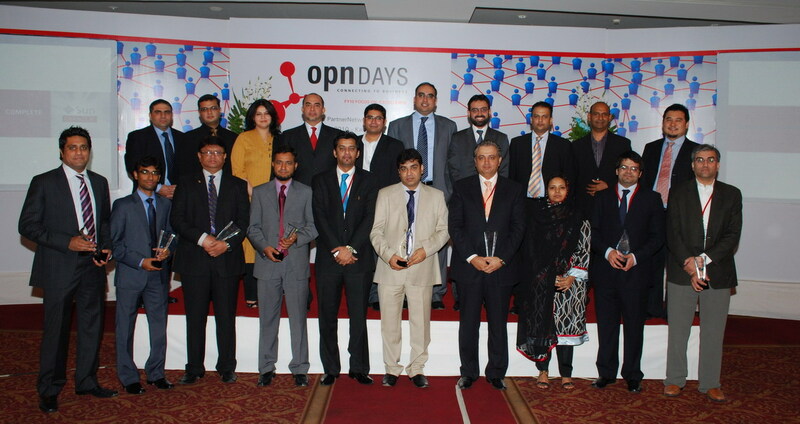 Oracle has introduced the revamped Oracle PartnerNetwork (OPN) Program – OPN Specialized at OPN Day – Pakistan. This new program represents a significant evolution of the Oracle PartnerNetwork. OPN Specialized allows partners to formally certify specializations to differentiate themselves and their offerings, be recognized for their expertise and become preferred solution providers to Oracle customers. Recognizing partners for innovative and successful uses of Oracle technology, Oracle announced the recipients of the Oracle PartnerNetwork Awards – Pakistan FY09 at the event. Winners were selected for excellence in solving real-world customer challenges and for their development and deployment of Oracle Solutions. The FY09 OPN Awards recognized seven leading partners, across ten categories. The OPN Awards recognized partner excellence in Technology, Applications, Industry, Oracle Accelerate and Mid market. OPN Specialized delivers new tools to aid partners, including a new partner ordering portal, an improved enablement environment for training, a new marketing events calendar, and an enhanced Solutions Catalog. Built on the foundation of Oracle Enablement 2.0 training and support, the OPN Specialized program will enable partners to establish industry recognition by following a formal process to become specialized in key Oracle solution areas. This allows partners to expand customer sales by differentiating themselves in the solutions and services they offer. Remarketer: The entry level to Oracle OPN Specialized is Oracle’s successful VAD (Value-Added Distributor) Remarketer program. Through Oracle’s VADs, partners can resell Oracle 1-CLICK products with no contract or fees yet access to online training and sales tools. Silver: The Silver level also focuses on the 1-CLICK products and has a wealth of Oracle engaged benefits including access to the Oracle Partner Business Center, Support, enhanced educational offerings and development licenses to increase competitive positioning and profitability with midsize businesses. Gold: Gold partners will receive access and resell rights to the full Oracle Technology portfolio and also allows partners to apply for resell rights for Oracle Applications. At this level, partners can start building competency and business credentials to become specialized. Platinum: At this new elite level of OPN Specialized, partners receive the highest engagement, commitment and benefits by showcasing the depth and breadth of the Partner’s expertise in five or more specializations of Oracle solutions. Specialized partners also receive a wealth of additional benefits, including tailored logos around each attained specialization, placement on Oracle.com through the Solutions Catalog, additional free assessment and exam vouchers, free support requests, demonstration solution services and access to implementation methodologies.